With built-in Water-Cooling System for Hot Countries. The HEKA AFRICA 2200 has a water cooling system, essential for hatching success in hot conditions. To operate the water cooling system all that is necessary is to connect the incubator to a cold water supply pipe. When brooding large numbers of eggs, from days 10/12 the embryos become exothermic, producing heat. If this happens during a hot spell this can raise the temperature to above the set level causing potential danger to the embryos. The computer control system uses the water cooling system to maintain the precise temperature that has been set. 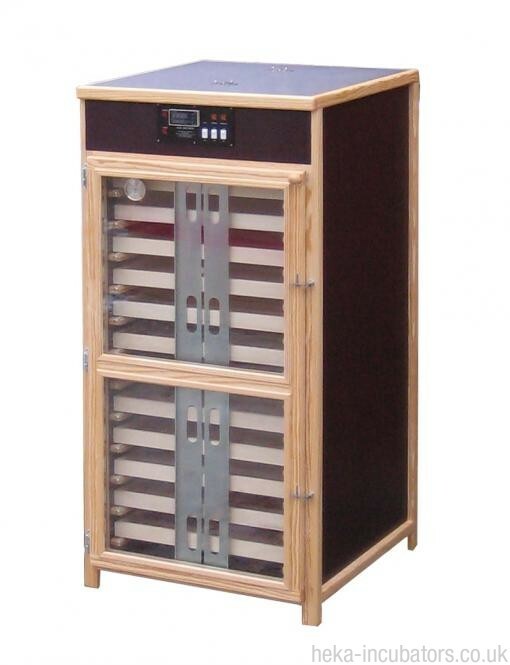 Behind the incubator, there is a turning-motor (exterior, covered), which is connected with the trays by a push-rod and white connectors (powder-coated aluminium). The motor pushes and pulls the trays automatically forwards and backwards. For best success in brooding, all our incubators do 12 turnings per day. With connectors of different length, you can turn any number of trays. Of course, this turning can be reprogrammed or deactivated by you for the hatching-phase. The incubator is equipped with a fully-automatic humidification system. It includes a water- canister, which is the water reservoir for the humidification. A float valve regulates the water supply from the canister to a water container with a heater. Every time while heating (continuously at heating up and in short impulses when set-temperature is reached), the water- heater is activated, which heats the water and evaporates it.This is a failure-free and reliable technique for best success in brooding. It's also possible to connect the incubator directly to your water line. If you request this, we then adjust your machine for this higher water pressure. To match the high class cabin we install what is probably the most reliable control system on the market with absolutely precise temperature regulation. This control has a failure rate of under 0,1% in the first 5 years - a value, which confirms the incomparable high quality of HEKA-incubators. All incubators in the HEKA Euro-Lux series are equipped with double glazing. The insulation value is much better in comparison with single glazing, and uses less energy. Also, insulated glazing does not begin to steam up until higher than ~80% humidity, and higher values are not normally required. The incubator is completely equipped with all the accessories that are needed. Included is an interior light, twelve incubating trays of your choice and two uncovered hatching baskets, a detailed manual and different connectors for turning any quantity of trays.